InstaRipper Tool - Hack Any Instagram Account! InstaRipper is a must-have application for any Instagram user! Its powerful password hacking feature will allow anyone to recover their lost account in just few minutes. But keep in mind that we (authors of the app) will not be responsible for any illegal activity performed with this tool, such as breaking into other people's accounts without their knowing and permission. What's the secret of InstaRipper's function? If you're so curious to know how this software accomplishes its action successfully, the secret lies deeply inside its code. A well known hacking method called "Brute-force attack" is a main role of this program activity. But not the ordinary brute-force way is integrated inside the InstaRipper. We had to develop a customized add-on which will spoof the main loop of brute-force cracking code whose aim is to attack an Instagram's login page. Because if your login is invalid in multiple attempts, Instagram will block your IP address from trying to login again and sometimes even block an account. To stop this blocking, we have to make a "mask" so it can automatically change a new fresh IP after few failed login tries. That's why InstaRipper has its own VPN server from where it drains virtual IP addresses to make its cracking attempts unlimited. These IP addresses are automatically created by auto-running software on its server, so you don't have to separately download it. InstaRipper connects to it by itself every time you run it. So it's all easy and user friendly. At this time we're working on new version of the tool with full bulletproof layer enabled which will automatically block any new patch from Instagram's security system. So while the FUD version is under its latest stages of development and beta testing, you can download the 1st version from the link below. After the final version of the app gets released for download, a new social pages for support will be launched too! Please stay tuned and visit the site often for the updates. Our Facebook and Twitter pages have just been launched. Please follow us! 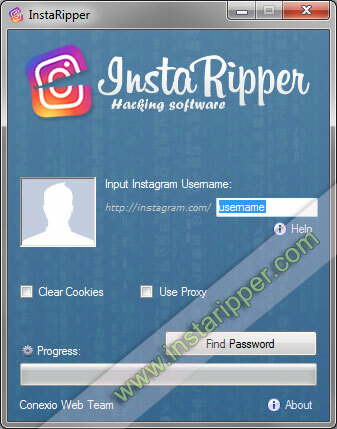 Get the tool now and hack Instagram account in just few minutes. InstaRipper app will successfully work on Windows, Mac, Android (APK) and iOS devices. * Jailbreak is not required for iPhone users. To download, click the button below to go to the files page. Terms of Usage: For personal purpose only. It's strictly prohibited to hack Instagram accounts which you do not own.